Mike and Mike announce a new segment that will hopefully help out the writers out there. The "Book Consultants" segment will consist primarily of Mike M's journey to resurrect one of his novels from POD/slushpile hell, and of making it more marketable this time around. Also, they will be taking questions and requests for the steps along this process, in addition to bringing in other industry professionals who can help take your writing to the next level. First up: the act of writing. There are different approaches you can take with your writing, from treating your story as a property to choosing what media/format to release your story in, so much more goes into your story than simply putting words to paper. 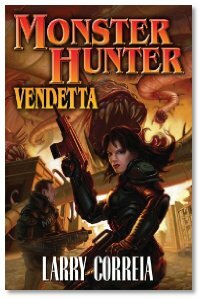 Interview: Mike and Mike talk with Larry Correia about his newest book, Monster Hunter: Vendetta, and the world and monsters he's created. Monster Hunters International introduces us to a corporation of specialty contractors who "take care of" supernatural monsters, collecting the bounties on them, and at the moment, there are two books out in the MHI series, with another 8 under contract. Larry talks about his unusual journey into becoming published, how he juggles his writing with the day job he's not yet leaving, the workflow plans for his upcoming collaboration with John Ringo, his favorite authors and reads, and more. In the first segment of the show you discussed the online publication of the author's world; sharing in the online environment. Do you have any that you consider good, or better, examples?